What is Wonders & Worries? 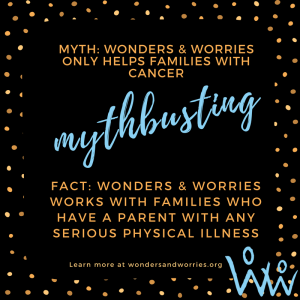 Wonders & Worries is a Texas-based nonprofit that provides free, professional coping support to children and teenagers during a parent’s serious illness. Services are available in English and Spanish. What does Wonders & Worries do? Emotionally healthy families are the cornerstone of a thriving society. Wonders & Worries’ expert child life professionals ensure that children and teens can reach their full potential, despite a parent’s serious illness. Wonders & Worries provides free, professional support for children aged 2-18 who have a parent with a serious or chronic illness. Consultations, classes and support groups are also available for parents. Why do children and teens need support if they’re not the ones who are sick? Children with a seriously ill parent who do not receive adequate support are vulnerable to serious short-term and long-term consequences. This includes increasing the child’s risks for behavioral, emotional and academic problems. Learn more about evaluations of our services and research in this area. What do the children and teens get out of the program? Nothing. All Wonders & Worries services are free of charge to families. This includes individual and group sessions, parent consultations, parenting classes and family fun events. When should a family connect with Wonders & Worries? As soon as possible after a parent’s diagnosis. Our research-based materials and activities take a few sessions to absorb – ideally, this happens before problems emerge at home or school. The earlier we can connect, the greater our ability to guide a family and build a strong foundation for parents and children. Does Wonders & Worries work with illnesses other than cancer? Yes. Wonders & Worries works with families who have a parent with any serious, physical illness. Families facing mental health or substance abuse issues will be guided to other resources. Does Wonders & Worries offer bereavement support? If a family connects with Wonders & Worries before a loss occurs, they are welcome to receive bereavement support with us. However, if the loss has already occurred, families will be guided to other grief resources. Does Wonders & Worries work with siblings of ill children? No. Siblings of chronically ill children are best served through hospital-based child life specialists because of the connections with their medical team. Families needing sibling support are encouraged to request consultation with a child life specialist at their next clinic appointment. Wonders & Worries can provide referrals to additional resources. What if the ill family member is a grandparent? Grandparents often have a vital caregiving role. As such, grandparent illnesses are considered on a case-by-case basis. Call 512-329-5757 to talk through your situation with our professional staff. What’s the best way to connect with Wonders & Worries? The best way to access support is to call 512-329-5757 in the Austin area or 210-307-4853 in the San Antonio Area. No referral is required. You can also refer a family through our online form. Medical professionals can fax a referral to 512-298-3607. Still have questions? Call 512-329-5757 or email info@wondersandworries.org.